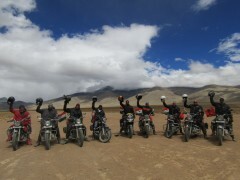 This Ladakh motorbiking trip takes you from the green valleys of Manali, through the stark and dramatic landscapes of Leh on one of the most iconic motorbiking routes in India. You'll ride with an experienced road captain and a mechanic, alongside a group of like-minded bikers. During the day, you'll see spectacular views of snow-capped mountains, ride across streams of melting glacier waters, and thunder through high-altitude roads that lead through pine forests and barren mountains. At night, you'll camp in comfortable tents or stay in hotels and drift into a relaxing sleep after a day spent outdoors. 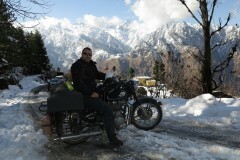 The adventure begins as you get your motorbikes in Manali and thunder past forests and orchards of Himachal Pradesh. As you cross state lines into Jammu and Kashmir, you'll notice the greenery clearing away, giving way to the brown mountains and grey sand dunes of Ladakh. Soon, you'll find yourself in the cold deserts of Nubra Valley where double-humped camels wander, and camping by the famous Pangong Lake, where the water changes shades every hour. Arrive at the bus stop in Delhi. Here, you'll meet your fellow travellers and board an overnight Volvo bus to Manali. You'll spend the night in the bus, as it drives into the green hills of Himachal Pradesh. Overnight in transit. Today, you'll arrive in Manali in the morning, freshen up, have a cup of tea and rest in your hotel rooms. You'll have a short orientation session with your road captain, to discuss the weather, route, equipment and protocol of your upcoming adventure. 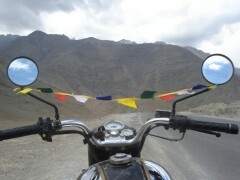 In the evening, you'll also get to test ride your motorbikes in the narrow streets and bylanes of Manali. Overnight in a hotel at Manali. 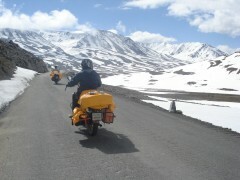 Ride back from Leh to Sarchu, an important stopping point for travellers plying the route. As you exit Ladakh, enjoy the last of the desert kingdom's stark views and landscapes. Overnight in tents at Sarchu. On the last day of your motorbiking adventure, you'll arrive back in the meadows of Manali after a relatively short and easy ride. Spend the rest of the day at leisure. Call it a night in the hotel room or head out to explore the hill station. Overnight in a hotel at Manali. Spend the day at leisure in Manali. After checking out of the hotel in the morning, you can celebrate with your fellow travellers and explore the city. Visit the famous Manali Mall road for any gift shopping or stop by local places of attraction in the city. In the evening, you'll board a Volvo bus back to Delhi. Overnight in transit. The Volvo bus reaches Delhi by late morning. Your trip ends here. • Please carry all specific personal and prescribed medications, or medicines that suit you. You'll spend the night in the bus. No meals are included in the package for today. You'll check into a hotel room in Manali. Rooms have attached Western washroom, and are usually on twin-sharing basis, unless the total group size is in odd numbers. Breakfast and dinner will be provided at the hotel. Overnight in Swiss tents in Jispa. Spend your night in Jispa in twin/triple sharing Swiss tents with attached washrooms. Todayâ€™s package includes breakfast and dinner. Overnight in tents in Sarchu. Spend your night in Sarchu Plains in twin/triple sharing Swiss tents. Today's package includes meals of breakfast and dinner. Spend your night in Leh in twin or triple sharing hotel room. Todayâ€™s package includes breakfast and dinner. Spend your night in Leh in twin or triple sharing hotel rooms or tents. Todayâ€™s package includes breakfast and dinner. Overnight in tents at Nubra Valley. Spend your night in Nubra Valley in twin or triple sharing tents. Todayâ€™s package includes meals of breakfast and dinner. 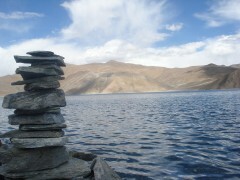 Spend your night in Swiss tents along the banks of Pangong Lake, in twin/triple sharing tents. Todayâ€™s package includes breakfast and dinner. You'll return to your hotel in Leh today. You'll be staying in twin/triple sharing hotel rooms. Todayâ€™s package includes breakfast and dinner. Spend your night in Sarchu Plains in twin or triple sharing tents. Today's package includes meals of breakfast and dinner. You'll check into a hotel room in Manali. 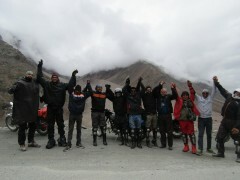 Here you'll give up your bikes, and spend the rest of the day enjoying yourself in Manali. Breakfast and dinner will be provided at the hotel. Eat breakfast in the hotel, and then check out. You can spend the rest of the day exploring Manali. By evening, it's time to head to the bus stop and catch your bus to Delhi. Only breakfast is provided today. You'll reach Delhi early in the morning. Trip ends here. You'll be catching the Volvo bus from Delhi (included in the trip cost). You can get to Delhi by flight from both international and domestic hubs, or by road or train. The operator will arrange your transport to Manali by Volvo bus.